■ The utility of the setup for retrograde injection of methylene blue is enhanced if the surgical team has access to the syringe rather than having the circulating staff inject from "under the drapes." 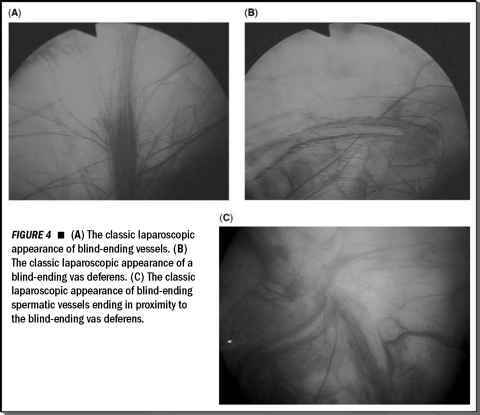 Therefore, on the sterile field, one ampule of methylene blue is diluted in 300 to 400 cc of sterile water or glycine—saline is avoided if one anticipates the use of monopolar electrocautery for fulguration of the diverticular epithelium (Step 8). A 60-cc syringe with the prepared methylene blue is filled and connected to additional sterile extension tubing to be kept on the field. Once the patient has been repositioned, prepped, and draped for laparoscopy, the two free ends of tubing off the field are connected by the circulating staff.